Statistics indicate that only 3% of all missionaries and only 1% of missions giving is sent to reach two billion people in the world who have no access to the gospel. Very few missionaries are being sent to people who have never heard the name of Jesus. Yet, God is doing something amazing in the Middle East and people are coming to Christ there in unprecedented ways. 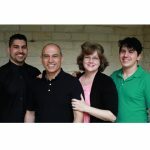 Our family is ready to go and reach those among the unreached and unengaged in Lebanon. Engage – We love building relationships. Whether it’s having people over for dinner, hosting a game night, or leading a home group, it’s all about developing community and helping people in their current life situation. Explore – We specialize in hosting small groups and investigative Bible studies in our home, providing a place where people can ask their difficult questions and encounter the God who loves them. Establish – We have a burden to see believers grow in Christ and deepen their relationship with Him, communicating the present and eternal value of loving God and loving others. Ramiz’s Lebanese upbringing, facility of the language, and deep understanding of the culture will enable him to seamlessly integrate with the people. Jenny, who is about to complete her MDiv, has a passion for teaching and helping women and children. Thani has a plan for reaching the next generation through music and the arts. Theo desires to make friends and mentor younger believers. If our ministry fits with your giving goals, would you consider partnering with us through prayer and financial support as we go and reach the Middle East for Christ?